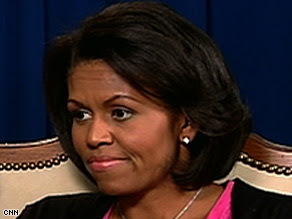 Michelle Obama will be heading to daytime TV in June when she appears on "The View." The popular ABC daytime talk show had invited her to be a guest this month, but she sent back word that she would like to be a host like Cindy McCain did in April, said Bill Geddie, the show's executive producer. "Equal time -- that's hard to argue with," he said Wednesday. Being a guest host will allow Michelle Obama to help interview guests and participate in the opening "hot topics," or banter about what's in the news that day. It offers the chance for someone to show a more complete personality than just sitting for an interview and talking about themselves, Geddie said.